Somewhere, mixed in with hundreds of baby photos, there is a picture of my mom’s brother, the uncle I never knew. I searched for hours yesterday trying to find it. I wanted to show the photo to remember Hugh A. McMullen, III, (“Mac”) on this Memorial Day, 2016. It has been over 70 years since my mother’s only brother made the “Supreme Sacrifice” in France as part of the European Theatre of Operations in 1944. I did not know much about my mom’s brother when I was growing up. He died when she was seventeen, the last of her immediate family. She was a six month old baby when her father, Hugh A. McMullen, Jr., apparently died of “Bright’s Disease,” per a newspaper clipping I found online. This is a revelation as I don’t think my siblings and I have ever known the cause of his death. My mom always seemed unsure about how her father died. Apparently one of her uncles, John Patrick McMullen, also died of “Bright’s Disease”, something to look into further. It was only a few years after Hugh, Jr. (“H.A.”) passed, that my mom’s mother, Eleanor Roberts McMullen, also died. She and Mac went to live with their maternal grandmother, Katherine P. McDonald. After growing up without her parents, I can’t imagine what it must have been like for my mom to have her only brother go to war. He left in March 1943 and was 18 years old. On September 16, 1944, he was reported missing. My sister Marilyn posted this link recently which includes photos where my uncle is buried in France. Marilyn, her husband Paul, and my mom visited Mac’s grave fifty-one years after he died. Associated Press TUESDAY, OCTOBER 17, 1944 – Two Lose Lives Battle Action Pvt’s. Hugh A. McMullen, III, and Ernest Eckard Make Supreme Sacrifice In France. Two Cumberland soldiers are reported killed in the European Theatre of Operations on today’s list of war-zone casualties, They arc Pvt. Hugh A. McMullen, III, 400 Washington Street, and Pvt, Ernest Eckard, 221 Springdale street. Pvt. McMullen had been reported missing in action on the south of France front since September 16. His death-in-action was confirmed by a War Department message today to his maternal grandmother, Mrs. Kathryn P. MacDonald. A graduate of LaSalle High School in 1942, Pvt. McMullen was a student at the University of Maryland when he entered the Army in March, 1943. He embarked for overseas duty last November and saw service in the Anzio beachhead campaign and further north on the Italian peninsula before being transferred to the fighting front in Southern France. Pvt. McMullen was a son-of the late Hugh A. McMullen, Jr., and Eleanor (Roberts) McMullen, His paternal grandmother is Mrs. Hugh A. McMullen, 515 Washington Street. He has one sister; Miss Jane Humbird McMullen, of Cumberland. Obituary of my mom’s father, H. A. McMullen, Jr.
Hugh A. McMullen, III, was awarded the purple heart. That is what I find truly remarkable about your mom. Although she must have suffered terribly through the tragedies she experienced, she was imbued with kindness and grace and never failed to shine her light on others. Simply an amazing woman. Thanks so much Gail. And thank you for your son’s service, I was thinking about you both today. The photos you post of him are wonderful. Thanks for adding this Greg! You have always been interested in our family history and I’m so glad you wrote about it in the post above. 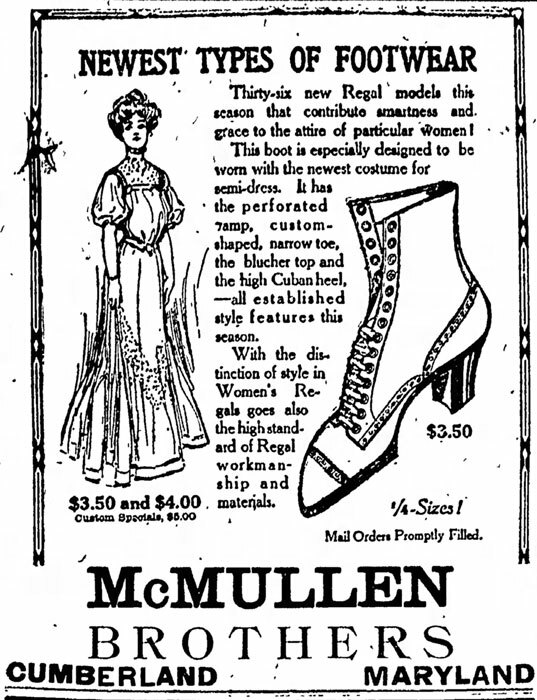 I found a lot written about Hugh Sr. and also found advertisements for the McMullen Brothers store! A story of profound loss. What an impact that must have had on your mother. Thank you for posting the photo of the cemetery in France. I’ve heard that it’s very moving to be there and I’m sure that being there to visit the grave of a loved one must be very impactful. Thank you for sharing on this Memorial Day. Yes, I wish I had been with my mom on that trip. Though she had much loss in her life, she was full of joy, humor and love.